August is an extremely busy time of the year for moving. That’s not because Americans like loading boxes and furniture into a truck in stifling heat. Instead, it has a lot to do with what’s on the calendar. As the Dog Days of Summer move closer to fall, colleges and universities get ready to kick off their fall semester. That means that tens of thousands of incoming freshmen move to campuses and new cities nationwide, with most going through that process in August. Of course, a great number of colleges and universities that attract students from all over America are based in the northeast. While general college moving tips apply for students relocating to these campuses, there are some extra factors to look out for. There’s often a temptation to bring the whole farm off to college, so to speak, since college students are on campus for the better part of the year. But student housing really isn’t designed to hold tons of stuff, and on-site storage options are less than ideal. Ask hard questions about the functionality of each item before deciding whether to pack it. There’s another good reason to stick to essential items in the northeast — the potential of relocating to particularly tight living quarters. Some of the country’s oldest universities are in the northeast, and there’s a great amount of urban campuses as well. While typical dormitory housing is about the same size in many campuses, student housing in older buildings might have lower ceilings or smaller closet space. While dozens and dozens of clothes would seem to fall under the “non-essential” category, outerwear is an exception. It can get pretty cold in major northeast cities during the winter, and universities located in rural areas often see even colder weather. 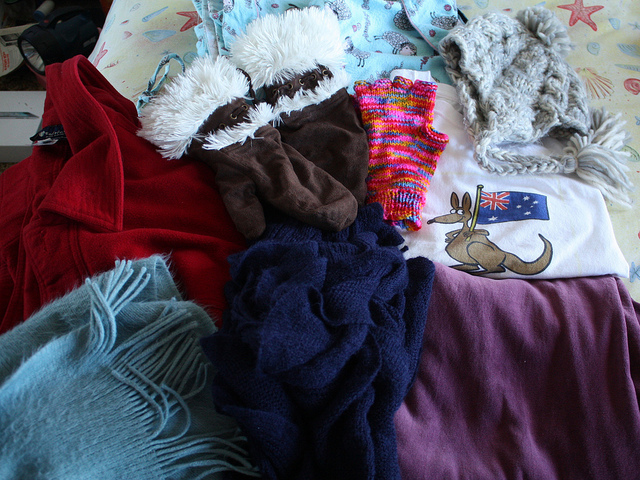 While it’s hard to think about winter during triple-digit heat and stifling humidity, it’s still important to bring plenty of hats, gloves, winter coats, scarves, sweaters and sweatshirts to campus. It will make a big difference when the mercury takes a nosedive! 3. Think small. Buy later. 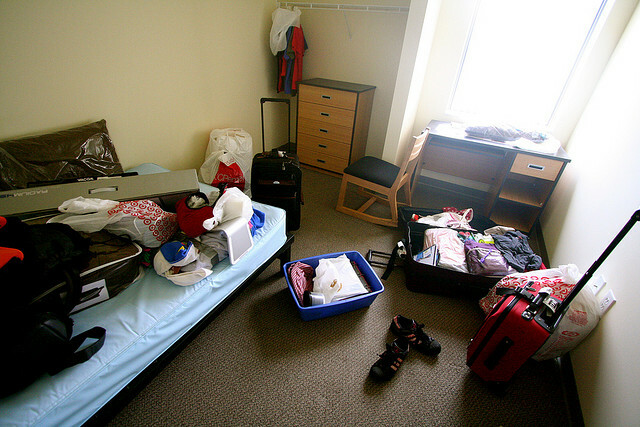 First-time college students often move into student housing sight unseen. Even if that isn’t the case, it can still be hard to get a sense as for how many belonging will fit in a student’s living area until they’re actually living there. Since the move-in process is often times exhausting, stressful and nerve-wracking for students and parents, guessing wrong by bringing too many items can be a disastrous experience—particularly in a region with so many old colleges and tight living quarters. Think small when packing. If you’re on the fence about an item, always remember that students can make a shopping run near campus later to get whatever else they need (and have room for). 4. Efficiency is the name of the game. In order to maximize space in student housing, bring items that leave the smallest footprint. Fold out comfy chairs, laptop computers and small flat screen TV’s can all be closed up and stowed away easily. Pop-up hampers, folding shoe racks and similar items can help make the most of closet space, and they can also be moved easily if another item needs to go in that space down the line. Raising and bunking beds are dorm living staples, but there are few other ways to add substantial storage space to a dorm room. Even student apartments and off-campus housing might not provide you much room to store all your stuff (particularly in cities in the northeast), so thinking efficiently is incredibly important. 5. 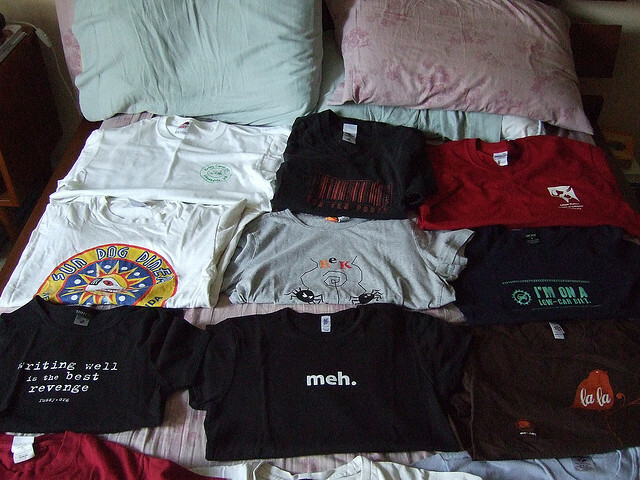 Don’t bring lots of t-shirts. They might have different students, campuses and fight songs, but colleges and universities all seem to share one staple: free t-shirts. Students will likely get t-shirts for some combination of academic programs, sports teams, fraternities, sororities, special events, clubs, organizations and promotions, and they won’t spend a dime on this sizable wardrobe expansion. Bringing lots of t-shirts to campus now could cause logistical issues later. Students can always do laundry when they run out of t-shirts to wear to class. If you’re looking to make a move to college, or anywhere else, Garrett’s Moving and Storage can help. We’ve moved thousands of customers both across the Dallas-Fort Worth Metroplex and across America since 1992. For a free moving quote, click here or call 972-487-5843 today. This entry was posted in Stress Free Moving Tips, The No Pack List and tagged college moving, long distance moving, moving to college in the northeast. Bookmark the permalink.